Football: The New York Jets and quarterback Mark Sanchez reached an agreement on a five-year contract Wednesday that includes $28 million guaranteed. The Jets made the announcement while Sanchez, the fifth overall pick in the NFL draft in April, was still at practice during the afternoon session of minicamp at Florham Park, N.J. Agent David Dunn said the deal is worth “around the $50 million mark,” but could reach as high as $60 million with incentives. Detroit gave No. 1 overall pick Matthew Stafford a six-year deal worth up to $78 million. Sanchez led Southern California to a Rose Bowl victory over Penn State with a record-setting performance in his final college game. 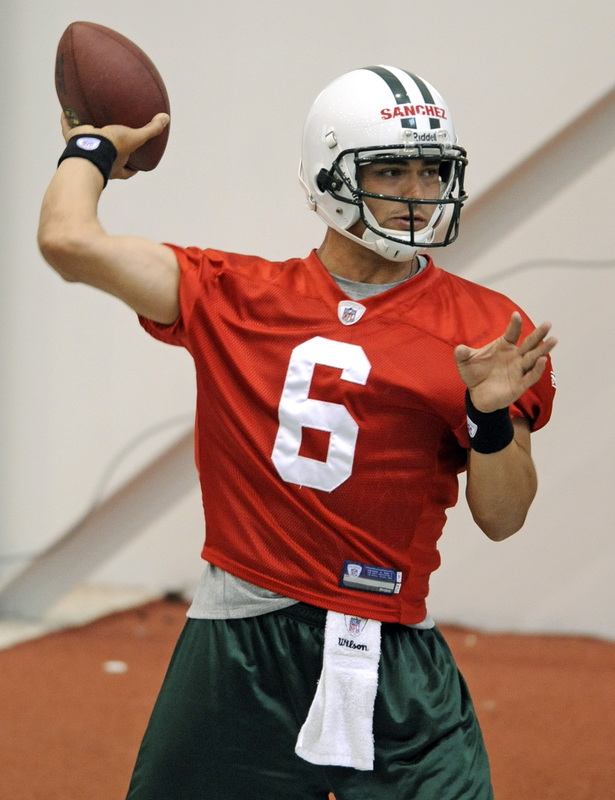 He’s competing with veteran Kellen Clemens for the Jets’ starting job, up for grabs after the retirement of Brett Favre. •Childress denies Favre deadline: The Vikings never told quarterback Brett Favre to make up his mind by this week if he wants to play, coach Brad Childress said. Childress said the team has no timetable for Favre to decide about coming out of retirement again to lead Minnesota. •NFL installs spinal treatment: The NFL is starting a spinal treatment program for retired players. The league will make specialists available at five hospitals across the United States to evaluate and treat retirees with spinal injuries. It will be available to any player whose pension is vested, which comes after he has played three seasons plus four games. Basketball: A new study shows that 43 percent of the professional positions in the NBA’s league offices are held by women, giving the league its highest grade for gender. The report issued by the University of Central Florida’s Institute for Diversity and Ethics in Sport showed an increase of 2 percent of women from last year in the league office. That’s higher than any other men’s pro league in any previous study. The annual study was first issued in 1998. •Ex-Illinois star arrested: Authorities say former Illinois basketball standout and 2001 Big Ten Player of the Year Frank Williams has been arrested on drug charges. Williams, 29, and his 24-year-old brother, Aaron, were arrested after agents for the Multi-County Enforcement Group executed a search warrant at a Peoria, Ill., home. Agents seized 78 grams of marijuana, a digital scale and a .40 caliber handgun. NHL: Canadian billionaire Jim Balsillie says he’s “one step closer” to bringing the Phoenix Coyotes to southern Ontario. Balsillie made the statement on his Web site, a day after Tuesday’s hearing in U.S. Bankruptcy Court on his bid to buy the Coyotes and move them over the objections of the NHL. Judge Redfield T. Baum indicated the NHL is entitled to a relocation fee, and if Balsillie balks at the fee as too high, his bid would evaporate. Balsillie painted the issue in a positive light in a message posted at makeitseven.ca, the Web site he has developed for his effort to move the team. •Stars send Tippett packing: The Dallas Stars fired coach Dave Tippett, the first major move by the team under new general manager Joe Nieuwendyk. A person familiar with the decision confirmed the firing to the AP on the condition of anonymity because the team was not releasing the news. •Molsons make bid on Canadiens: Three Molson brothers confirmed they have made an offer to buy the Montreal Canadiens, the Gillett Entertainment Centre and the Bell Centre. Geoff, Andrew and Justin Molson say the bid was delivered to George Gillett, who owns the Bell Centre and about 80 percent of the NHL team. Soccer: With David Beckham back in the starting lineup, England moved within a win of a World Cup berth by routing Andorra 6-0 at Wembley, England. Beckham made his 112th international appearance, starting in central midfield in place of Gareth Barry, who was suspended, and Michael Carrick, who is injured. The Los Angeles Galaxy midfielder hadn’t started a competitive international match since a European Championship qualifier in June 2007. Swimming: Swimming and diving coach Richard Quick, who led 13 teams to NCAA titles during his collegiate coaching career, has died of cancer at Austin, Texas. He was 66.